A thoroughly enjoyable #ROHBallo @TheRoyalOpera last night. @MalteseTenor makes everything sound so very easy. Thinking of adjectives for #ROHBallo... 'meh', 'ho-hum' and 'bleurgh' are top of the list. Really wish I enjoyed #ROHBallo more... Whilst there was some beautiful singing, the conducting & uninspired production really left me cold. Great singing, sets and costumes so so, odd conducting at times but the orchestra triumphed! #ROHBallo Overall it looks tired already. #ROHBallo wasn't even a glorious failure - it just never ignited. There was no love or betrayal on that stage. Fabulous singing in #rohballo this evening. Sublime cast! 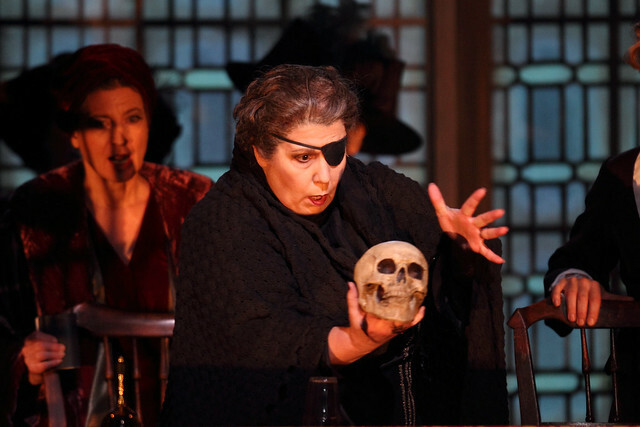 What did you think of Un ballo in maschera? This has now been amended. Sadly this was a very mediocre night indeed, a great opera made to sound v uninvolving. Absolutely terrible conducting, pulling it out of shape and threatening to lose it more than once. Dull production , statues coming to life , straight out of faust, was its only 'idea'. When the best singing is the Oscar you know this is not a great Ballo night. Audience reaction was very muted indeed. Such a contrast to the magical Tristan a few days ago ! MUTED? Not sure where you were seated but those around us in the Amphi seemed to LOVE it? "Brava! Bravo"! Just wonderful. Would you consider varying your seating location in house? Seriously refreshing ... never sit in the same zone twice during a season to fully appreciate every aspect? I left the Royal Opera House after the opening night of Ballo wondering what had just happened. A wonderful Verdi opera with a worls class cast and yet there was absolutely no magic to the evening, absolutely no thrilling moments during the performance . The new production is OK (nothing fabulous but nothing really awful ) the singing was fine and yet the entire evening fell short of stirring any real emotions from the audience. No booing, no bravos just a very bland reaction to unfortunately a very bland evening. I thing here we have a case of absolutely terrible conducting and this is the main reason for this unfortunate dull evening. Very sad indeed. With this wonderful cast this should have been a rousing premiere. substandard production with some terrible clunky direction of the chorus and principals. Not what I expect froma. World class house. This second-rate show is exactly what one might expect from a provincial German house - and, guess what, the ROH got this from Dortmund. No doubt the production didn't cost much (a sensible consideration) - but perhaps it would be good to know which era of ROH staff (ie before or after Kasper Holten) saw this and thought it was good enough for Covent Garden. This was a boring and uninspiring production. Some of the singing was delightful but on the whole it was a tedious performance. I couldn't help comparing it with some wonderful performances I've seen in the past. ROH you can do better than this. Another new production, another critical drubbing. When are the Royal Opera House management and board going to wake up to the fact that the current policy of hiring directors isn't working properly? David McVicar, Laurent Pelly, Leiser and Caurier et al may been overexposed in the previous management era but at least they produced reliably thoughtful, well-prepared shows that were widely enjoyed and were revivable. Now many audience members await the new productions with dread rather than excitement. Time for a rethink? Yet another production in which the director has the bright idea of creating a scene which both the librettist and composer were too stupid to think of. To describe this clunking awkward production as provincial would be an insult to all the theatres outside the Greater London area. Best summed up as poor production, indifferent singing apart from the Amelia who was good and as for the conducting words fail me. The second night was a dismal, mediocre experience with zero magic and even less chemistry between the principals. None of the plot was therefore believable. Some of the best acting and movement was by the statues. Did the orchestra and cast ever rehearse together? And depression on the stage was matched by the complete absence of Christmas spirit in the House. The drab graffiti display by the toilets was matched by one miserable Christmas tree and no lights or decorations in the PH Hall. What has happened to excellence, fun, enjoyment and magic at the ROH? Are we being made miserable for our own good? At these prices we expect much better. sangue de’ negri" you might at least have the guts to translate it for the surtitles rather than just putting up "She's called Ulrica." PS More on the surtitles: in the first scene we learned of Ulrica's "flashing eyes" but in the next we find she actually only has one (see photo above). A very small point perhaps but a sign that no one can have bothered much about this show. Good that people have started booing this conductor, by the way. It's a wonderful score but Oren took the life out of it. ROH New Year's resolution: To stop hiring Mr Oren! "the “new” Un ballo in maschera...sets new standards of pitifulness on all fronts, with a tatty and cheap AmDram staging which would have looked passé sixty years ago at the old Sadler’s Wells...and easily the worst conducting I’ve heard in a Verdi opera in over forty years, together with a clutch of soloists not one of whom rises to the level of acceptable mediocrity"
I went to the production of Un Ballo on 2nd January in anticipation of a magical evening in the Christmas period. There was some good singing from the three principal leads but overall it was a lacklustre performance. There was no emotional chemistry between Riccardo and Amelia. The only principal with any stage presence was Renato. The staging was uninspired and lazy and the ball scene was just so incredibly dull and boring. The stage set ghastly, no colour or glamour and the costumes looked as though they had come from a charity shop. Not surprising that the stalls were emptying before the curtain calls! Also the ROH used to have lovely Christmas trees and decorations - where were they?! A bit bah humbug. Pity. Old fashioned Die Fliedermaus AmDram musical direction. Pappano and Holten are responsible for engaging a conductor whose talents are clearly not suited to serious opera in what should be and once was a premier venue. Is Pappano unable to cope with talented conductors being engaged at ROH ? This was possibly the worst serious opera musical direction ever known at this Covent Garden theatre. Standards have now fallen so low in both production and musical achievement, and consistently, that those responsible for music theatre at ROH are evidently accountable for the decline. Standards are now kept up only by the singers in what is now a long list of dire and pitiful productions. And there are notable absences this season. I saw Mr Holtens comments on the now frequent booing - how it was the audience who did not understand modern productions. Blame the audience ! The shocking decline is not in the auditorium ! 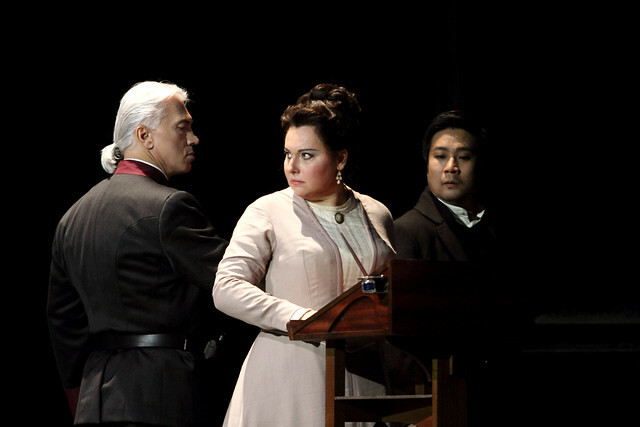 On 29/12/14 Monastyrska and especially Hvorostovsky were more or less performance absent in Acts l and ll. More like rehearsal singing. Monastyrska's performance was only vitally begun with "Morro, ma prima in grazia". They both came alive to performing after the interval and Act lll was riveting. On 02/01/15 they were consistently better. Calleja was full blooded and his ringing tones filled the house. Jihoon Kim was outstanding in the small part of Tom, far better and more committed than anyone apart from Calleja and Serena Gamberoni as Oscar. His vibrant singing and stage charisma turned the short trio in Act lll into one of the most memorable performance moments. The production was pitiful and amateur. The sightlines in a horse shoe auditorium are inevitably variable, but to ignore the spatial consideration so completely - and yet again ! - it illustrates a serious ongoing contempt for the audience and the theatre itself - the failure of the ROH board to practically address the ongoing decline in standards is unfortunately publicly irresponsible. Cinema attendance successes are linked to a historical perception of excellence still maintained. What will happen if that perception changes negatively as opera /music /theatre direction at ROH continues to decline ? Thank you for your comments. We do consider feedback from our audiences very carefully. I am of course very sorry that you feel ROH fails to meet the standards you expect from us. But I cannot recognise your point that Antonio Pappano should be against talented conductors being engaged at ROH. Daniel Oren has regularly conducted at ROH in the past as well as at the Paris Opera, Teatro Real in Madrid and Arena di Verona. And in 2014, the conductors at ROH have included Simon Rattle, Semyon Bychkov, Bertrand de Billy, Mark Elder, Mark Minkowski etc. Over the next months, conductors include Andris Nelsons, Nicola Luisotti and Alain Altinoglu. As for productions, I have never said – or would ever say – that booing is because the audience does not understand modern productions. That would be extremely arrogant. I have said that some productions are more divisive than others, and that for some of the controversial productions, opinions vary very much among both the audience and critics, so it is hard to say who is ‘right’ and who is ‘wrong’. In fact, I think it is impossible to talk about what ‘the audience’ feels, likes or understands, as the audience will always be diverse in taste. Many people here on the blog disliked our new production of Manon Lescaut, for example, but when asked specifically about the production in our audience survey, a clear majority responded positively. It is correct that 2014 has possibly seen more productions that were divisive than previous years, although they were divisive for very different reasons (some being criticised for being too radical, others the opposite). This should not necessarily be seen as a mission statement. We employ directors based on their merits and previous achievements, and then we try to support their vision, but there is never a guarantee with a new production – or with any kind of artistic enterprise – for success. We believe in a variety of production styles, and I hope you will feel in 2015 that ROH delivers the standards that you expect of us. We do certainly take all feedback very seriously and will work hard on our new productions for 2015. I hope some of them will be to your liking. I for one much appreciate Kasper Holten taking the trouble to comment here (although he does not answer my earlier question as to whether this provincial production was chosen before he arrived or not - given the long lead times in the opera world Holten may feel professionally obliged to defend shows which in fact predate his employment). However one correction: the booing on this occasion has been for the conductor, not the production. I have been going to the opera regularly (anywhere between twice per moth to twice per week) for about 8 years now, and I have seen small-town-middle-of-nowhere and great ROH, Vienna, Munich etc productions alike. I'm only 25, but I feel like I will soon be retiring to recordings of old performances at home. There are so many talented operatic voices (old and young) and great orchestras around, but it seems to me like there is a serious lack of opera directors. 2014 has truly been a disappointing year as far as new ROH productions are concerned. I think with fear of the upcoming 2016 production of La Boheme and I can only hope that ROH won't repeat one of the recent disasters. Thank you for your comments on our recent productions. The Royal Opera House is at its final stage of preparations for a new production of Andrea Chénier which is sumptuous, beautiful and set in the period of the French Revolution, so I would not retire to listening to records quite yet! Opera productions vary throughout the world, and the Royal Opera House is trying to bring the best directors and productions from Europe and overseas. This Season Thaddeus Strassberger made his UK debut with I due Foscari, starring Plácido Domingo. Idomeneo was wonderfully sung, and had not been seen at the ROH for many years. Martin Kušej is one of the leading opera directors in Europe, but his production was not well-received. Having seen it myself, I felt some scenes were very touching. Together with an award-winning Tristan und Isolde, and an incredibly funny L’elisir d’amore, I feel that we have had a varied programme. Looking forward, I can assure you that Andrea Chénier will not disappoint. I am also very much looking forward to Rise and Fall of the City of Mahagonny which I have only seen once, and Krol Roger should be a revelation. Our Directors are very keen to offer something for everyone – some of our supporters prefer traditional productions and others prefer modern interpretations. Many thanks for your comments and your support. What a dispiriting eve at ROH. The production was just dire, and why oh why does the ROH keep contracting Daniel Oren? He has ruined Romeo and Juliette, the Meyerbeer opera, and now Ballo in a house that has a great Verdi conductor as its MD. What is going on. I shall be avoiding anything Oren conducts in future. big mistake to read your blogs before hearing Un Ballo......I have been to some less enjoyable productions in 2014 but the singing here was exquisite and the orchestra held together. Consider this as early Verdi and the calls of "bellisimmo/a" and bravo/a last night. I agree with Veronica Schroter. Even if the stage direction was confusing and deterred from the singing at times, the voices were exquisite. no means the case. What were the come-to-live statues or ghosts meant to tell us? My last outing to ROH was to the dire production of Idomeneo so it was a relief to see at least a decent improvement on that. I preferred the Ballo production of 2005 conducted by the marvellous late lamented Charles Mackerras but I thought the singing last night overall was excellent and in my hearing Calleja live for the first time, I thought he was excellent and so much better than when seen on tv. The singing was excellent, but sadly the production seemed ill thought-out. The director had a few interesting ideas, but failed to introduce them so that they made any sense. Anyone not familiar with the opera would have been confused. (In fact, my guest who had never seen this work was perplexed!) The production from 2005 was much better. How can Susan Fisher seriously say that Idomeneo was wonderfully sung!!?? It was distinctly mediocre to my ears. One of the worst things I have ever seen at the ROH. I read these comments before going to the performance on 17 January and expected to be disappointed. In fact we thoroughly enjoyed the opera - the soloists were superb and I fail to understand the complaints about the production , set and costumes all of which were perfectly acceptable.